Born in Germany, Elfi gained work experience with jewellers in Montreal, Canada and Berlin, Germany, before starting her jewellery apprenticeship at the Goldsmith and Watchmaker School in Pforzheim, Germany. In 1991 she gained her qualification as a certified goldsmith. After her technical training Elfi went on to study Jewellery Design at the University College of Design, Pforzheim for 4 1/2 years and gained her BA in Jewellery and Object Design in 1996. After her studies she worked as a freelance designer for jewellery and product design companies as well as designing and selling her own ranges. 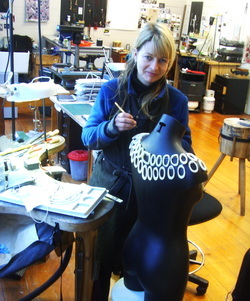 In 1999 Elfi immigrated to New Zealand and established 'The Filing Kabinett', a jewellery workshop / studio co-op in central Christchurch, which she relocated to Lyttelton in 2010 with fellow jeweller Jeremy Leeming. In the February 2011 Earthquake their beautiful workshop got destroyed. Their new studio and showroom is now in The Tannery Complex in Woolston. ​Her work has been widely exhibited in group and solo shows throughout New Zealand, Germany, The Netherlands, USA and Australia since 1993. Besides part time teaching and curating she mostly enjoys challenging work for new exhibitions. Her European background shows in her aesthetics and designs but she says concepts are more and more influenced by her new home New Zealand.